This highly portable cabinet provides enough facilities for the most demanding of performers and includes advanced features such as switchable subwoofer output, variable anti-feedback control, phantom power and multiple digital effects. A range of XLR, Jack and Phono inputs provides complete versatility and the potential for solo artists, duo's and ensembles to perform with a single lightweight amplifier. A full 400 watts of Class D switching output (ICEpower by Bang & Olufsen) is provided and the incredible dynamics and detailed image. With the integrated switchable crossover it is also possible to add an active subwoofer to create a full 3 way active system capable of providing huge reserves of power for any musical situation. 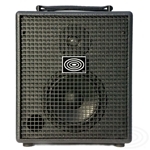 The JAM 150 Extension has been designed for combination with the JAM 150 compact amplifier, providing a 300W system that plays a similar role to the SIDE/UNICO combination in providing more output and better sound dispersion. 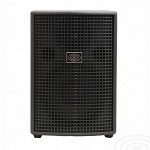 Perfect as a second stage monitor for duo performances, the JAM 150 Extension combination can also be used as a compact active PA system that suits a range of activities including some small-scale DJ applications. As a single, stand-alone loudspeaker system, the JAM 150 Extension can be teamed with a preamp such as Yellow Blender or Yellow Single for small-scale solo performances. WEIGHT : 12 Kg - 24.4 Lib. 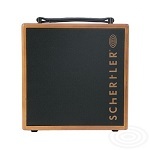 The ultra-compact GIULIA is the latest addition to Schertler’s Classic amplifier series. 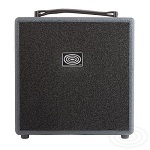 Ideal for small venues, home studios or for practice, the single channel amp has the same high quality sound, appearance and robust construction as its larger siblings DAVID and UNICO, while weighing in at just 6.3kg. Equipped with a 1” dome tweeter and 5” woofer, GIULIA offers 50W of bi-amplified power. Its input channel can accommodate both XLR and ?” Jack connectors, making it suitable for use with a wide range of microphones including Schertler’s DYN and STAT series, or the BASIK pickup. Phantom power (48V and 10V) is supplied. The input can also be used for a guitar or other high level line source, with the amplifier’s intelligent electronics automatically adapting to suit. The channel also has 3-band EQ and Warm low-pass filter to produce a warmer sound when used with bridge-mounted pickups. Separate Line and DI outputs enable connection to a mixer, subwoofer or other external device. GIULIA is also equipped with a high-quality digital reverb (controlled via potentiometer) and an Insert socket, enabling the connection of an external dynamics processor or a volume pedal. Equipped with a 1” dome tweeter and 5” woofer, GIULIA offers 50W of bi-amplified power. Its input channel can accommodate both XLR and TRS Jack connectors, making it suitable for use with a wide range of microphones including Schertler’s DYN and STAT series, or the BASIK pickup. Phantom power (48V and 10V) is supplied. The input can also be used for a guitar or other high level line source, with the amplifier’s intelligent electronics automatically adapting to suit. The channel also has 3-band EQ and Warm low-pass filter to produce a warmer sound when used with bridge-mounted pickups. 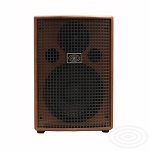 The ultra-compact GIULIA Y is ideal for small venues, home studios or for practice. Weighing in at just 6.3kg, the two channel amp has the same high quality sound, appearance and robust construction as its smaller sister GIULIA and its larger siblings DAVID and UNICO. Equipped with a 1” dome tweeter and 5” woofer, GIULIA Y offers 50W of bi-amplified power. GIULIA Y is equipped with 2 channels XLR and 1/4” Jack connectors, making it suitable for use with a wide range of microphones including Schertler’s DYN and STAT series, or the BASIK pickup. Phantom power (48V and 10V) is supplied. The 1/4" Jack input can also be used for a guitar or other high level line source, with the amplifier’s intelligent electronics automatically adapting to suit. The Master channel has 3-band EQ and Warm low-pass filter to produce a warmer sound when used with bridge-mounted pickups. GIULIA Y is also equipped with a high-quality digital reverb (controlled via potentiometer) and an Insert socket, enabling the connection of an external dynamics processor or a volume pedal. 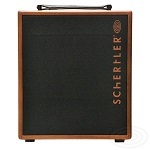 DAVID becomes the second member of Schertler's "next generation" acoustic amplifier series. This newly-designed 3-channel amp, combines a wealth of new features and updated technology with a new "look". DAVID's inputs will accommodate a microphone, an instrument and a stereo device such as a computer, MP3 player or CD. The instrument input and the Jack input on the microphone channel both feature a Bootstrap technology that enables the input to automatically adapt to any impedance. Some of the new DAVID amplifier's new features include: three channels, a range of controls including gain, switchable resonance (notch) filter, adjustable DI Out in the master section, mute switch and overload LED for each channel. A new digital reverb replaces the spring one found in the original David models. ขนาดความกว้าง x ยาวx สูง 29.5x25.5x35.5 ซม. 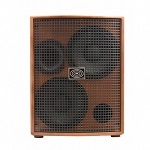 JAM becomes the third member of Schertler’s “next generation” acoustic amplification series. The new 5-channel “all-rounder” combines a comprehensive feature set with the updated technology and enhanced “look” that defines all the models in this latest range. Equipped with a 1” dome tweeter and 8” woofer, and featuring an optimized 2-way bass reflex construction, JAM offers 200W (150W + 50W) of bi-amplified power. 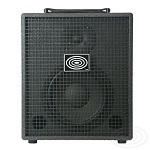 The amplifier includes a balanced microphone (XLR) input, an unbalanced mic/instrument input and an input offering both balanced microphone and unbalanced mic/instrument options. Both instrument inputs feature a Bootstrap technology that enables the input to automatically adapt to any impedance. A separate stereo input channel will additionally accommodate devices such as a computers, MP3 or CD/DVD players. A 5th FX Return channel can also be used for inputting line level devices. The 3 main microphone/instrument input channels include a Gain control for input sensitivity regulation and 3-band EQ, with parametric mids on input channels 1 and 3 and a switchable resonance (notch) filter (240Hz/150Hz) on channel 2. Phantom power is supplied for condenser and electrostatic microphones. Each of these channels also features an overload LED. Channel 1 is additionallyequipped with a phase reverse switch to prevent feedback, or unwanted effects between the various channels. JAM’s Master Section controls include a new adjustable DI Out, a new Mute button, a Line Out enabling the connection of externalsystems, a digital reverb and an Insert for connecting an external dynamics processor. Connection options are further enhanced with an Aux Out (Channel 1) that also enables connection to other systems. 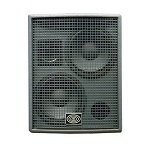 A Low Cut filter (cutting frequencies below 180Hz) can be used with instruments that generate aggressive low frequencies. This also enables a separate subwoofer to be connected without causing any damage to the amplifier. JAM is additionally equipped with a high voltage CLASS-A preamp that has no integrated circuits and No Negative Feedback (NFB). 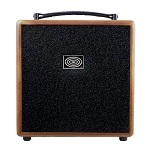 Amplifiers are available in a choice of wood or anthracite finishes. The more delicate wood finish is perfect for studio or home use, blending with a range of room interiors. The anthracite finish is designed for performance and touring applications, where a more robust exterior finish is required. ขนาดความกว้าง x ยาวx สูง 32.4x29.7x38 ซม. ช่องสัญญาณที่ 5 มี 2 ช่อง เป็นแบบหัวเสียบแบบ unbalanced 6.3 มม.